The renovation of Crawford Hall, designed in 1968, recaptures the original spirit of the mid-century building. Underutilized space on the first floor and the ground level was reclaimed as the SAGES / Inamori International Center for Ethics and Excellence Center. Key components of the SAGES program are comfortable, attractive and functional seminar rooms, adjacent to informal gathering spaces. The Inamori Center adds large scale flexible meeting spaces so that together, these spaces are now suitable for hosting academic conferences. The new SAGES Café helps connect the upper and lower level academic spaces. 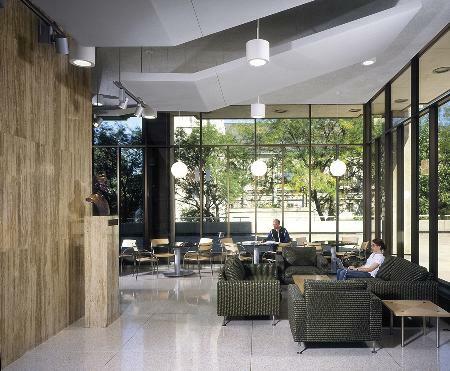 First floor existing partitions and dropped ceilings were removed and replaced with suspended, sloped acoustical panels with an integrated lighting system to support the open plan the college’s SAGES program requires. The panels create a visual pattern that unifies the open plan’s programmatic elements. Suspended wood ceiling panels serve a similar purpose on the lower level Inamori Center. Flexible teaching spaces are a requirement of both SAGES and the Inamori Center. Movable furnishings allow for alternative teaching configurations in small seminar rooms, as well as in large classroom spaces. Retractable sliding walls in the Inamori Center create a Japanese sense of spacial subdivision, and permit a quick and easy transformation of seminar rooms into large classrooms, meeting rooms or banquet rooms.